About-France.com - A thematic guide to France. Pont Gisclard - rail suspension bridge. The Yellow Train is located at the yellow circle at the foot of the map. Length: 62.6 km, almost 39 miles. Power: Electric 850v DC third rail. 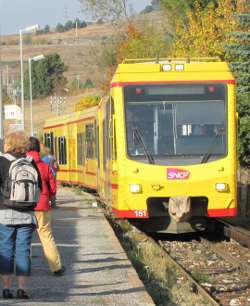 Electric train units: seven out of ten of the original units are still operating. There are also two modern panoramic multiple units, built by Stadler in 2004; these have air-conditioning, toilets and electric doors. One of the 2004 air-conditioned Stadler units. Below: Solar power station at Odeillo. Location: Starting point at Villefranche de Conflent, in the eastern Pyrenees, 50 km inland from Perpignan. Distance from Paris: 900 km by road . Nearest railway station: Villefranche-de-Conflent (Vernet les bains). (Mainline connection). Other access from Paris: TGV train to Perpignan, then connecting local train service. The Little Yellow Train runs from Villefranche de Conflent, 50 km from Perpignan, to Latour de Carol, near the Spanish town of Puigcerda. The most spectacular part of the route is the section from the start at Villefranche, up as far as the small town and ski-resort area of Odeillo – Font-Romeu. Hugging the sides of the deep valley of the Tet, the line winds up between forests, chasms and gushing streams. From the start up as far Mont Louis, near the summit, passengers are treated to spectacular views of the rocky mountainous scenery, including villages, two historic fortresses, and a precariously perched old hermitage. The line, which was begun in 1903, is a spectacular feat of civil engineering, and apart from the dozens of mostly short tunnels, it includes many bridges and small viaducts, plus two remarkable viaducts spanning wider valleys. These include the remarkable Pont Gisclard, or Pont de Cassagne, which is the only railway suspension bridge in France. After Mont Louis, the line continues to rise for a kilometre or so, before reaching a broad high valley, which it skirts along for seven kilometres as far as the station at Font-Romeu– Odeillo. From here, it then descends some 300 metres down to a high valley on the Spanish border, and the frontier town of Bourg Madame. The station at Bourg Madame is just a few hundred metres from the Spanish border, and it is easy to walk to the old Spanish town of Puigcerda. The line terminates a few kilometres further on, at the small town of Latour de Carol, where it connects with the French railway line from Toulouse, and the RENFE Spanish line from Barcelona. Historic walled city; a UNESCO world heritage site. The entire old city, crammed into the narrow valley floor, is circled by walls which were strengthened and fortified by the great military architect Vauban in the 17th century, after the area passed from Spanish to French sovereignty. Nearby: Fort Liberia, another Vauban fortification, perched on the mountainside above the town. Nearby: 6 km. Vernet les Bains, an attractive small old town, up a side valley; starting point for routes and trails to le Canigou, the emblematic mountain of the Eastern Pyrenees. Odeillo is a small Pyrenean mountain village, best known nowadays as the home of one of the world's very first solar power stations. Opened in 1970, the solar power station was one of the first serious renewable energy plants. Run by the French National Research Centre CNRS, the “Four Solaire” is within easy walking distance of the station. Guided visits daily. The villages of Odeillo and Via can be reached on foot from the station. Font Romeu is one of the more popular ski resorts in the Pyrenees. Hiking trail: a hiking trail (sentier de randonnée) leaves from the village of Via, just below the Odeillo train station; it is an easy 9km hike back to the station at Cabanasse – Mont Louis. Small and not particularly interesting town; but it is only a kilometre or so on foot from the station at Bourg Madame to the historic centre of the Spanish town of Puigcerda. Travellers coming up on a morning train and back on an afternoon train have time for a quick trip into Spain. Of interest to rail buffs; the station at Latour de Carol is the only station in Europe, possibly in the world, to serve three different "normal" railway lines operating with three different gauges*. The metre-gauge Train Jaune, the European standard gauge SNCF line to Toulouse, and the Spanish broad-gauge line to Barcelona. 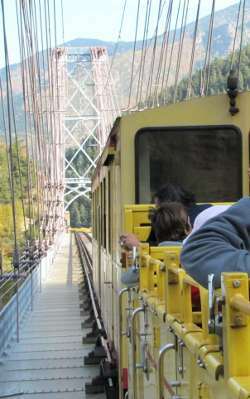 (* The station at Montreux in Switzerland also has three gauges, but these include special rack-and-pinion tracks). Though a historic scenic railway, The Little Yellow Train,is part of the French state rail network, run by the French train operator SNCF. Consequently, tickets come at standard French train rates, and can be booked online through the normal websites. IMPORTANT: key in Villefranche Vern as your departure point if you wish to leave from the main departure station, officially known as Villefranche-de-Conflent – Vernet les Bains. About-France.com recommends Trainline.com ... but read this first. The most popular trips are to start from Villefranche-Vernet les Bains, and travel to one of the highest stations at Mont Louis or Odeillo-Font Romeu, a bit further to Bourg Madame, or through to the end of the line at Latour de Carol. Due to a glitch on the SNCF website, it is not possible to buy tickets between two stations on the Yellow Train route online... not even on the SNCF website. To get round this problem and book online, one of the stations (either the departure or destination) needs to be off the Yellow train route. If you plan to travel up the line from Villefranche, the obvious solution is Ria (which is the next stop down the line from Villefranche in the direction of Perpignan). It will cost about a Euro more, but that way you can buy your tickets online with no problem. A single from Ria to Font-Romeu via Villefranche-Vernet-les-bains (where you have to change anyway) costs € 13.60 (August 2018) , just a few centimes more than the ticket from Villefranche to Font Romeu. And you can get your tickets online with no problem. You can then forget about Ria, and go straight to the station at Villefranche to start your journey..
►Now go to Trainline.com to book your journey online. Note that there are no reserved seats on the Yellow Train. Your ticket is valid on the date for which you purchased it. YOu are advised to get to the departure station half an hour before the train leaves, to ensure a good seat. ►Trainline.com French train tickets Best rates, no extra fee, no surcharge Available worldwide for print-your-own tickets or e-tickets. Tip .. As the line is part of the SNCF network, it is also possible to book a through ticket from, for example, Perpignan or Toulouse. Both ends of the line can be reached by normal-gauge train, the lower end by electric train from Perpignan, the higher end both by Spanish Railways (RENFE) line from Barcelona and Ripoll, and by SNCF trains from Toulouse and Foix. In the summer and at weekends, it is strongly advisable to book in advance, as the trains can easily be full. At other times, booking may not be essential, but remains advisable since all it needs is a couple of tour buses, and all the available places in any given train can easily sell out. The best time to go is in Sping or in September or October, when many trains travel half empty, specially on weekdays. The closest hotels to the main departure point are at Vernet les Bains, 6 km from the station at Villefranche. Click hotel names for online booking and more details. Recommended: Hotel Princess. A good quality three star hotel with restaurant. Reasonably priced. La Cabanasse-Mont Victor: Hotel Les Mélèzes - family hotel located 200m from the station.